Knowing how to use a whetstone helps you get close and intimate to the work and results in a better sharpening—plus it just feels more satisfying. You can sharpen your knives in any number of ways. There are electric sharpeners, filing systems, and belt systems… Many manufacturers even offer a sharpening service. Use that, however, and you have to mail your knives back to the plant and wait a few weeks for them to return. You could just learn how to do it yourself with a whetstone. Whetstones generally have two sides: course and fine grit. The course side works to pre-sharpen by grinding off the rough edge and any burrs. The fine grit side finishes off the work by working that dull blade into a super sharp edge. There’s not necessarily a consensus among knife sharpeners about whether or not to wet your whetstone. Some folks won’t use water and just go at it dry. Others like to use water or mineral oil. This reduces any heat caused by friction. We prefer to keep things lubed up. To use a whetstone, submerge it in water for at least 5-10 minutes. A longer time period just ensures saturation. Some people we know soak their whetstone for a minimum of 24 hours. After saturating the whetstone, place it atop a mat or towel. You need something to keep the stone from sliding around while also trapping wayward water. During sharpening, continue to apply water from time to time. As you work, particles from the stone will release. These small particles get trapped in the liquid and form an abrasive paste. Keep everything at a pretty runny consistency. 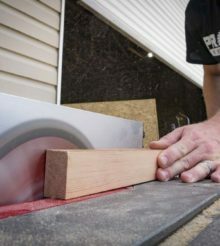 Using the coarse side of the stone, hold the blade at a 15-20° angle. It’s important to maintain the same angle the entire time you sharpen. Applying a light but even pressure, move the blade back and forth across the length of the stone. Depending on how dull your blade started, you probably require quite a few back and forths. To finish off, give the blade a couple quick swipes on the corner of the stone to knock off any burrs. When the first side has sharpened up, flip the knife over and repeat the process with the other side of the blade. After finishing the coarse grind, flip the whetstone over to the fine grit side. Repeat the exact same process on this side of the whetstone. Remember to always keep the blade angled consistently. Overall, using a whetstone isn’t rocket science. However, it takes some practice to get it right. Once you dial in a technique, you can start adjusting your angle for specific applications and steel blends that you have. If you’re an old hand at sharpening knives, and have any tips and tricks for how to use a whetstone, feel free to add them in the comments section below. Looking for a less manual way to sharpen a knife?